Along with the integration process and development of PVNC, the application of quality management system plays more important role in the process of production and business activities of PVNC. Since 2004, PVNC has implemented management procedures at the request of quality management system. 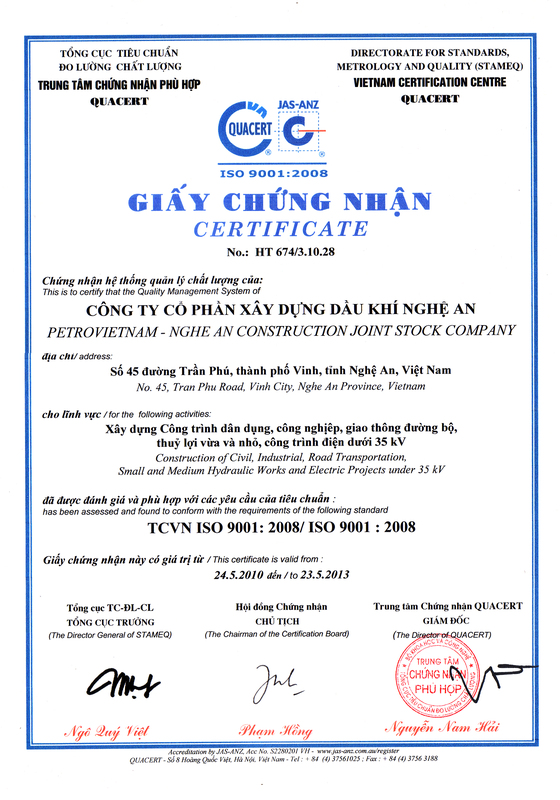 Through multiple reviews, in May 2010, PVNC has been issued appropriate Quality Certificate ISO 9001:2008 by Quacert Centre.Along with the integration process and development of PVNC, the application of quality management system plays more important role in the process of production and business activities of PVNC. Since 2004, PVNC has implemented management procedures at the request of quality management system. Through multiple reviews, in May 2010, PVNC has been issued appropriate Quality Certificate ISO 9001:2008 by Quacert Centre. Quality management system is a tool of PVNC provide standards for the management, production and business to help officials, public employees who perform the management, control quality consistently. Each staff member when assigned to perform duties in any working position can recognize that the work that they do influence policy and quality objectives. Corporation applies form to check the practice to assess the quality, training work, operating procedures, maintaining regular improvements to the requirements of ISO 9001:2008 system in order to raise quality management and production organization efficiently. Currently, PVNC has provided sufficient resources for management operations, building quality policy and quality objectives. The implementation of quality management system ISO 9001:2008 of PVNC with advanced technology line, modern machinery, a team of professional engineers, skilled workers. Therefore PVNC has constructed works with high quality trusted by partners.